Britain’s best selling homes magazine, Ideal Home Magazine has been helping home-owners to get the most from their properties for over 80 years. Ideal Home covers all aspects of contemporary living, from house renovations to kitchen and bathroom makeovers, interior design and much more. 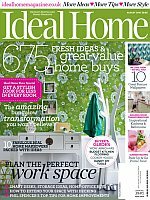 Readers love Ideal Home Magazine’s democratic approach to home design, which makes creating a beautiful, contemporary home fun and exciting. The magazine showcases the very best ideas, new products and best homes so anyone can put together their own unique mix. Order your Ideal Home subscription today for more tips, more style and more inspiration. Every issue features easy ways to have your home looking great, buyer’s guides, original and innovative decorating ideas, low maintenance garden ideas, recipes and more. As a subscriber you will save on the normal cover price, plus get free delivery to your door every month. And you’ll never miss an issue! 675 fresh ideas and bargain buys – affordable and amazing ways to transform every room… Clear the clutter – three of the best storage coffee tables… Amazing room transformations – new looks for kitchens and bathrooms… Steal their style! – five stunning real homes packed with clever ideas… Ten fabulous feature wallpapers… Ideal Home Magazine shows you how to choose the best wood burner… Warm up with gorgeous British wool… Switch to an eco-friendly heating system… Create extra space with a garage conversion… One-pot recipes – quick and easy comfort food… Buyer’s guides to dining tables & chairs, vacuum cleaners, fridge freezers and eBook readers. Plus more great articles and features like these with your Ideal Home subscription every month. Subscribe today! Who Reads Ideal Home Magazine? The magazine targets three key reader types: Respected professionals living in large detached homes, happy families living in modern detached or semi-detached homes and suburbanites living in comfortable homes with gardens. Ideal Home readers have a few things in common – they love their home and are actively decorating, renovating and refurbishing their homes. Most Ideal Home readers are between the ages of 25 and 55.